Brocades are for sales in the market or in shops or by street-vendors. There are hand-made or manufactured products. It takes a village-girl even half a month to make a brocade of 20cm long. Their skirts or costumes cost them long time to make. Their dresses express their patience, skills. Visitors can see the girls making brocades right in the market. Traditional values and identities are well-maintained in the market. 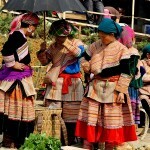 Such markets as Bac Ha, Coc Ly have really become rendezvous for visitors at home and abroad. There is almost no bargaining or competition here. Sales girls look quite naive, sincere. They go to the market mainly to meet people and exchange funs. Especially, there is a horse market in town-centre, each market-day there are almost 100 – 200 horses for sales or exchange. H’Mong or Tay or Dao ethnics’ minority girls and boys, with their best dresses on, go to the market to relax and meet their friends. At sunset, they leave with a promise to see again. 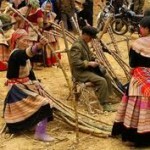 Visitors to Bac Ha are opportune to understand the local traditions and customs, taste local specialties, meet nice people and know a land code-named: white plateau.